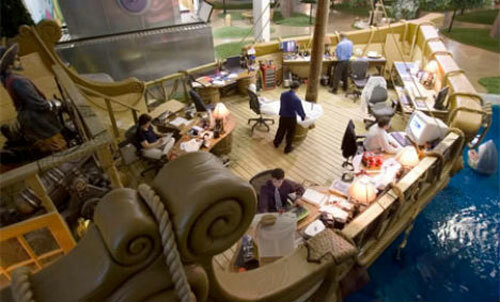 The amazing offices at Inventionland design factory in Pittsburg, Pennsylvania look more like a theme park than a workplace. With nearly 2000 items invented a year, they have made sure their staff are kept inspired by their surroundings every moment of the day. There are 16 uniquely themed sets that fill up the 70,000 sqft space. 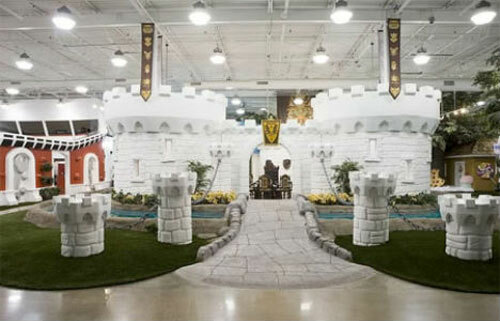 There is a huge luxurious castle where staff hold meetings at a round table like knights of old. 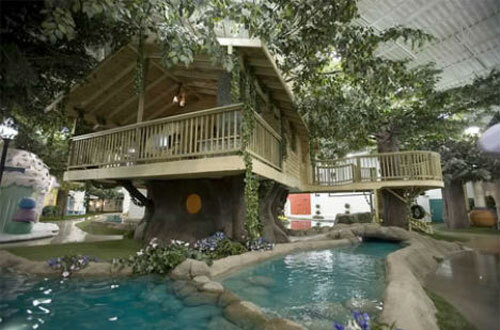 A treehouse overlooking a pond offers a unique space that cubicle-dwellers can only dream of. Where do you go when you need isolation to concentrate and perform your best. Well, in a cave of course. The pirate ship, set in a ‘sea’ of water complete with a great white shark. There’s a race track with a distinctive checkered pattern, elevated like a miniature arena, with the desks in the center. 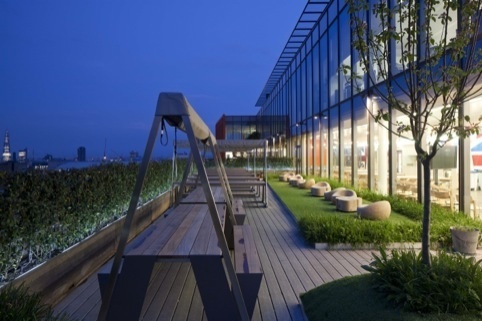 Not only are these office spaces visually stimulating, they are crammed with high-tech equipment. 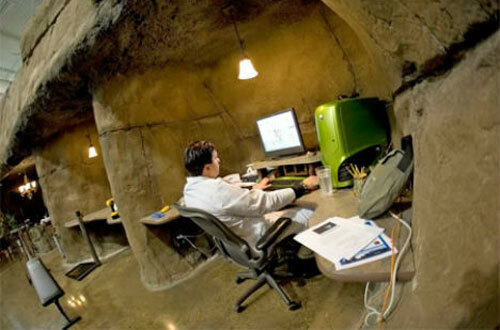 There’s a state-of-the-art sound, video and animation studio and workshops for building prototypes of their inventions. This must be one of the most beautiful government offices ever! 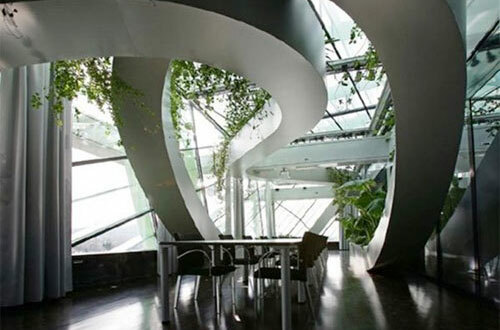 Not only is the greenery amazing, but the curved plant boxes create a real organic feel. 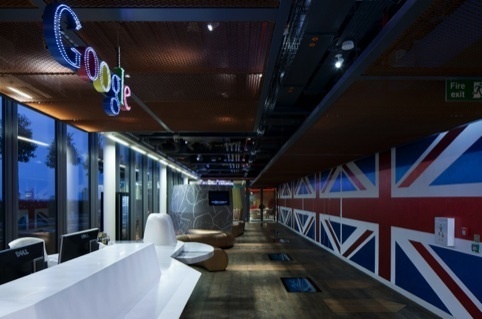 Google’s London office has been redesign into an amazing workplace where creatives and tech tech-heads love to work. 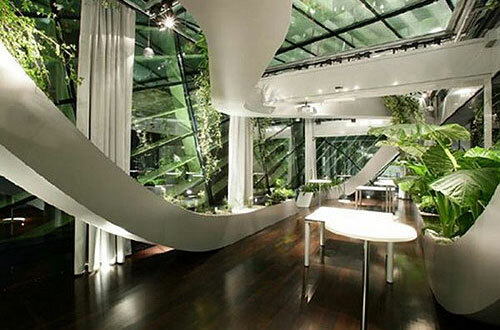 Designed by architect Penson Group, their theme was to create ‘visual fun’. And it isn’t just about style and design. Google employees have their own gym, dance studio and a bright orange shower room to get clean in. All these elements help Google to keep staff relaxed and at work longer, which has proven successful in their US office. 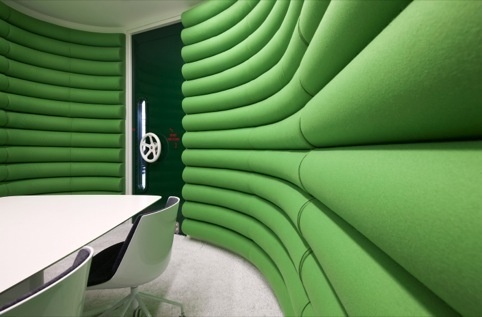 The green Submarine room complete with a soundproof door for those confidential meetings. Hidden garden balconies for relaxing in, no doubt with great view of too. Apart from the visual fun style, Google announced they would not be using and environmentally unfriendly materials such as PVCs, lead, mercury, etc.